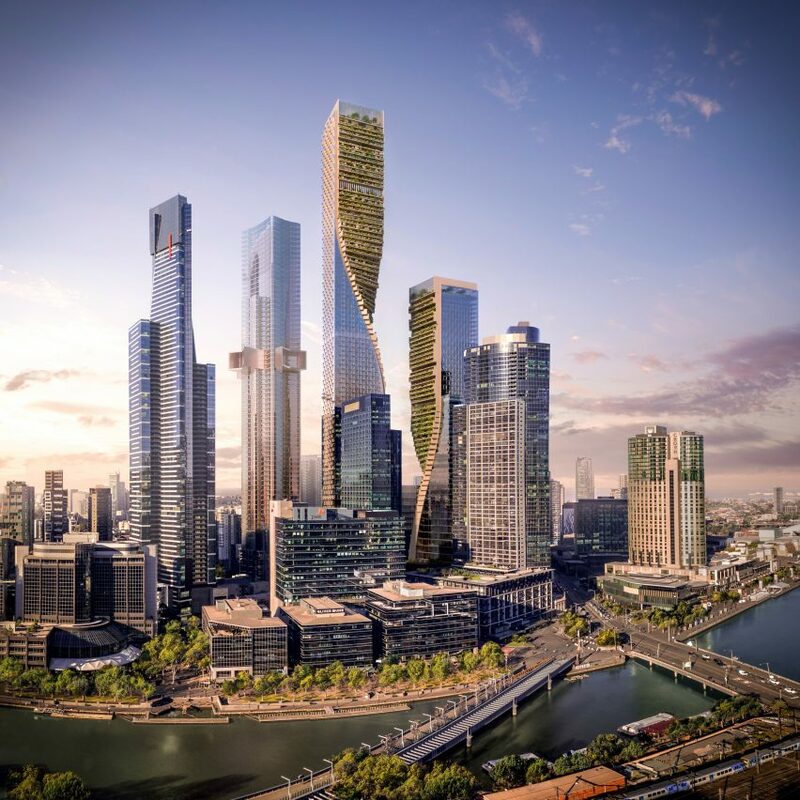 Supertall skyscrapers with rainbow facades and shaped like a mountain piercing a light-up cloud are on the shortlist for Southbank – a new tower in Melbourne, which if built would be Australia’s tallest building. 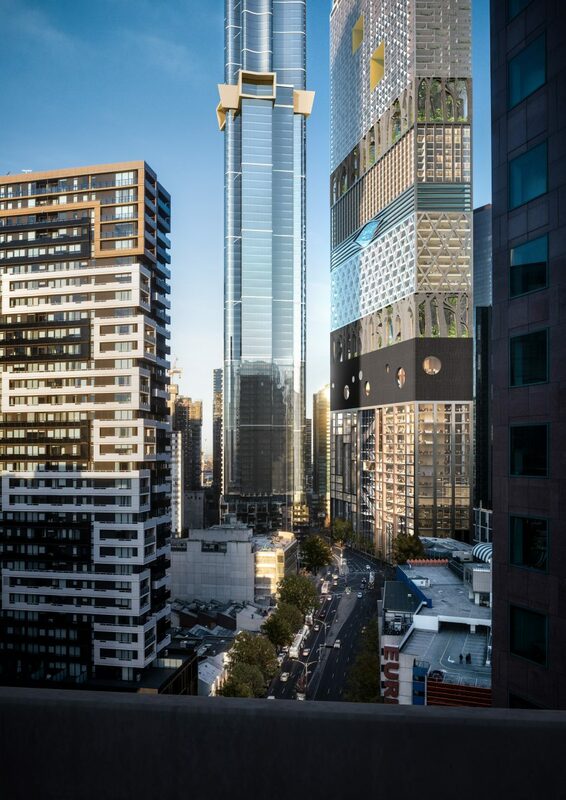 The competition, run by developer Beulah International, to design a £1.1 billion mixed use development in the Australian city of Melbourne has drawn entries from some of the world’s best-known architects. Six designs for supertall towers have been shortlisted from the following teams: Bjarke Ingels Group with Fender Katsalidis Architects, Coop Himmelb(l)au with Architectus, MAD Architects with Elenberg Fraser, MVRDV with Woods Bagot, OMA with Conrad Gargett, and UNStudio with Cox Architecture. 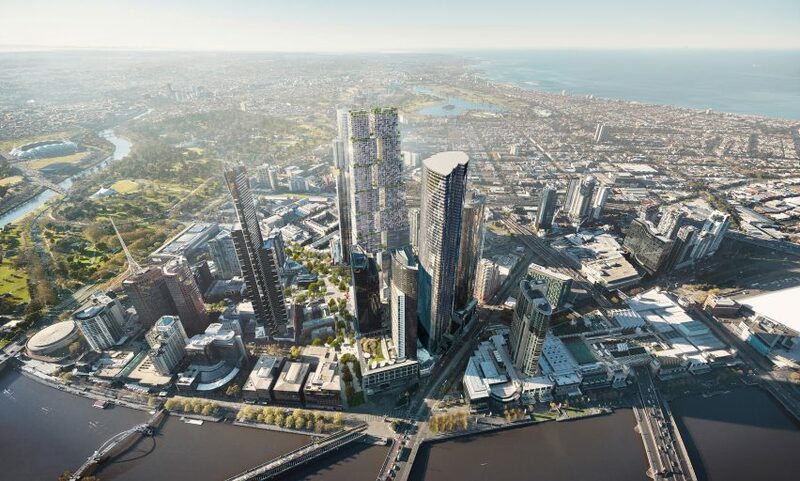 The developer purchased over 560 square metres of land on the Southbank Boulevard last year, and plan to turn it into a new “lifestyle precinct” with a hotel, shops and apartments along with cultural and public spaces. Beijing-based MAD Architects and local architecture firm Elenberg Fraser have proposed Urban Tree, a 360-metre-high “mountain village” surrounded by foothills, with a hotel shaped like an illuminated cloud near its summit. LEDs would light up the cloud at night, and renders show the tapering tower would have a glass facade pierced with trees. In the tower itself 43 floors would be residential with 23 given over to the hotel. A children’s playground, public artwork and a water feature would be arranged in the tower’s podium. Green Spine is the competition entry from Dutch architectural practice UNStudio and Australian firm Cox Architecture. It features two twisting towers with glass facades on their outer edges and terraced gardens on the inner sides. 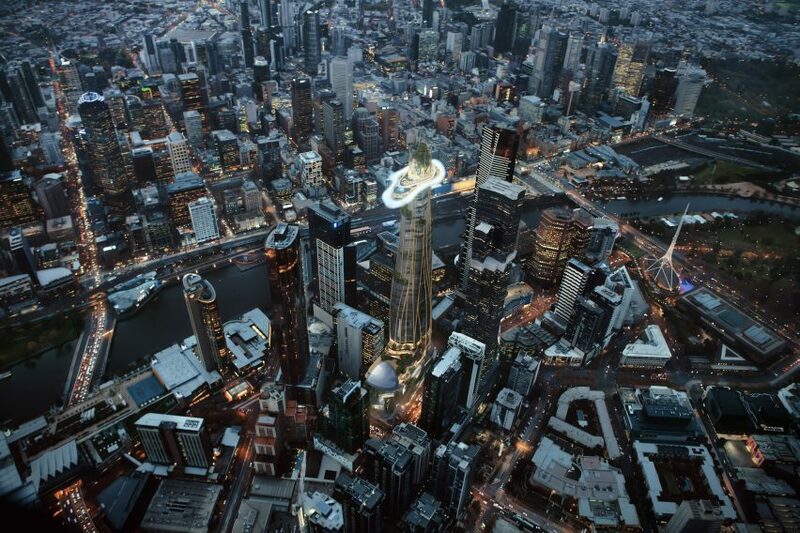 The 356.2-metre-high residential tower would be topped by publicly accessible botanic gardens. 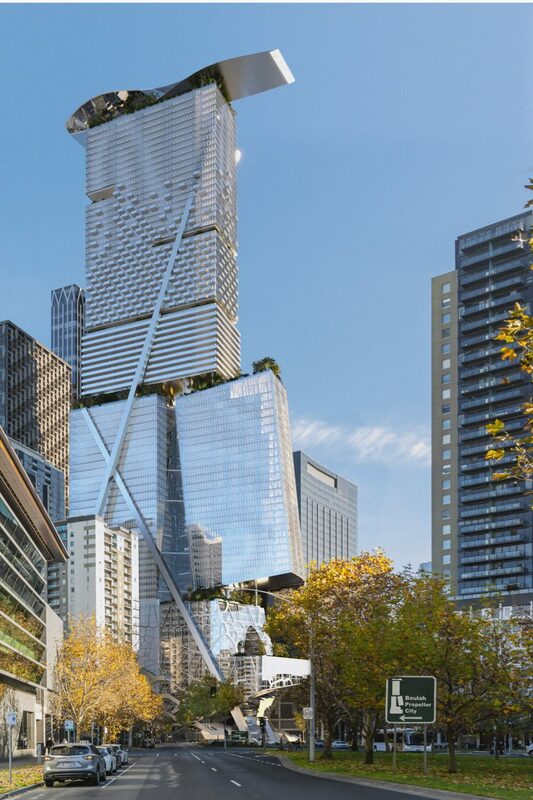 A shorter office and hotel tower would be 252.2-metres high. Visitors would enter through the conjoined base of the towers before climbing through stairs and stepped gardens, encountering a food hall, library, shops and a BMW experience centre along the way. 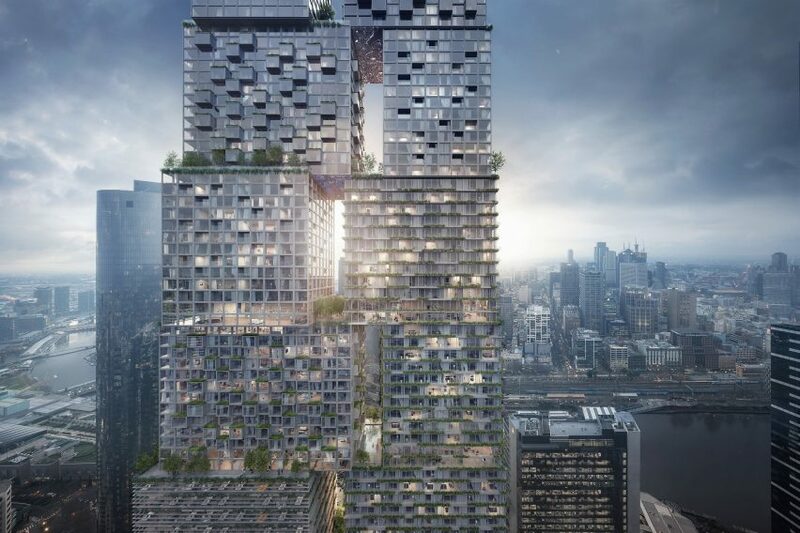 Copenhagen and New York-based BIG and Melbourne’s Fender Katsalidis Architects have proposed two 359.6-metre high interlocking blocks. Called the Lanescraper, its stacked shape would provide both stability and natural points of connectivity between the towers. A two-tiered concentric auditorium in one section would be able to hold 3,000 people, while a BMW experience centre would span four floors with a central void filled by a car lift surrounded by a spiral staircase. The Beulah Propeller City is the shortlisted entry from Viennese architecture firm Coop Himmelb(l)au and Melbourne-based Architectus. Shaped like a tri-blade propeller, the 335-metre-high tower would be topped by a penthouse with it’s own private landscape garden and pool. Residential areas would be prioritised, with 46 floors of apartments featuring high ceilings and full length glazing. The hotel would comprise 15 floors and have it’s own winter garden complete with tropical vegetation and a swimming pool. In the centre of the tower a hotel pool with an underwater glass window would be surrounded by stepped terraces. Elsewhere in the skyscraper visitors could enjoy a tropical garden where residents would be able to job or walk their dog along treetop walkways. Rotterdam-based OMA and Brisbane architecture practice Conrad Gargett’s unnamed proposal for the Southbank is a colourful take on the traditional vaulted markets and arcades found in Melbourne. 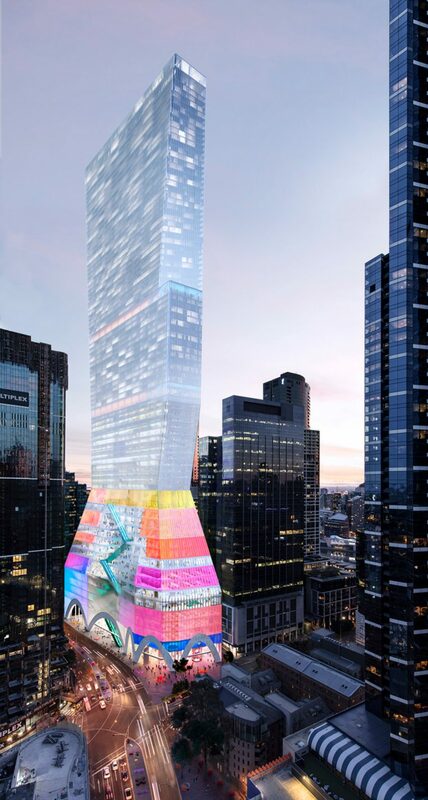 Emphasising the foot of the tower rather than the top, a “vertical city” would be built between arches supporting a rainbow-coloured facade. All the cultural, commercial and educational functions of the development would be located here, with the hotel, residences and offices placed in the tower above to give them the most light. The winning design will be announced in August. Foster + Partners have revealed reworked designs for Melbourne’s new Apple Storeafter 53,000 people signed a petition against their original plans, which earned the derogatory moniker of the “Pizza Hut Pagoda”. In Adelaide, Diller Scofidio + Renfro and Woods Bagot saw off competitions from Adjaye Associates, BIG and David Chipperfield Architects with their winning design for a new art gallery.